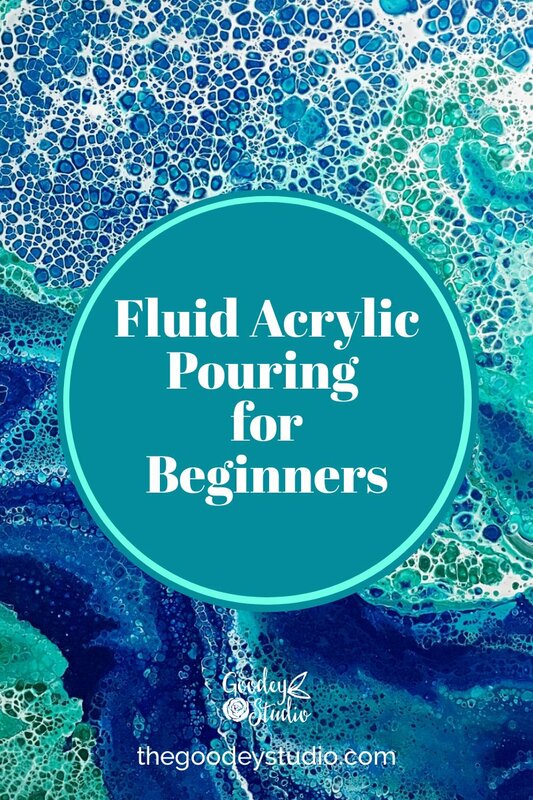 Whether you are a beginner, hobbyist, or just want to try something new, Fluid Acrylic Pouring is an addictively easy and fun way to create beautiful abstract art. 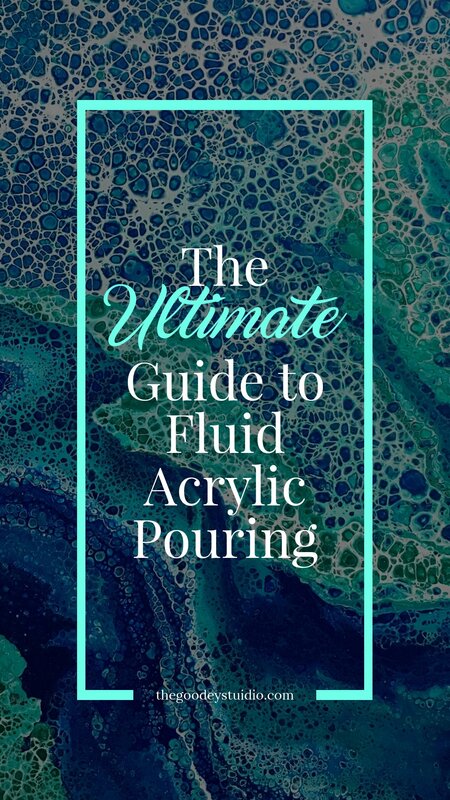 Sometimes this art form is also called Fluid Acrylic Painting or Acrylic Pouring since the paint is applied to the canvas by literally pouring it on! That’s right no brushes required! 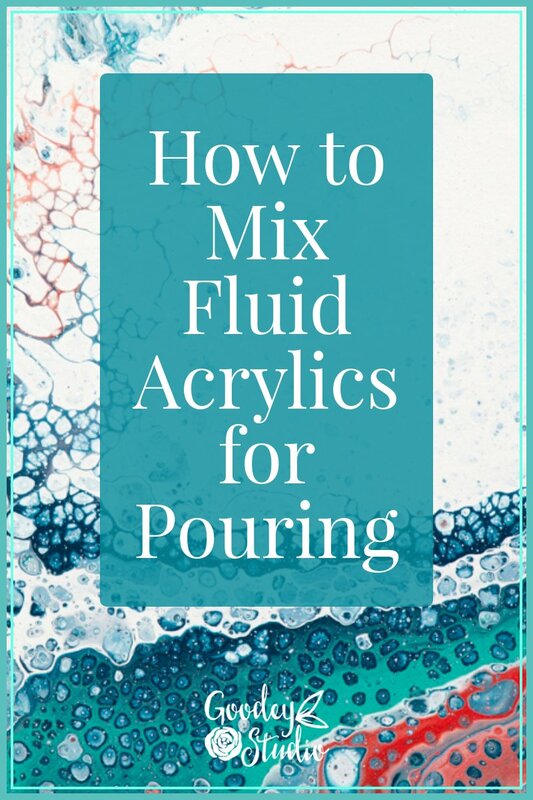 So if you are ready to get messy, loosen up and have fun making art, then keep reading my guide on Fluid Acrylic Painting for Beginners! 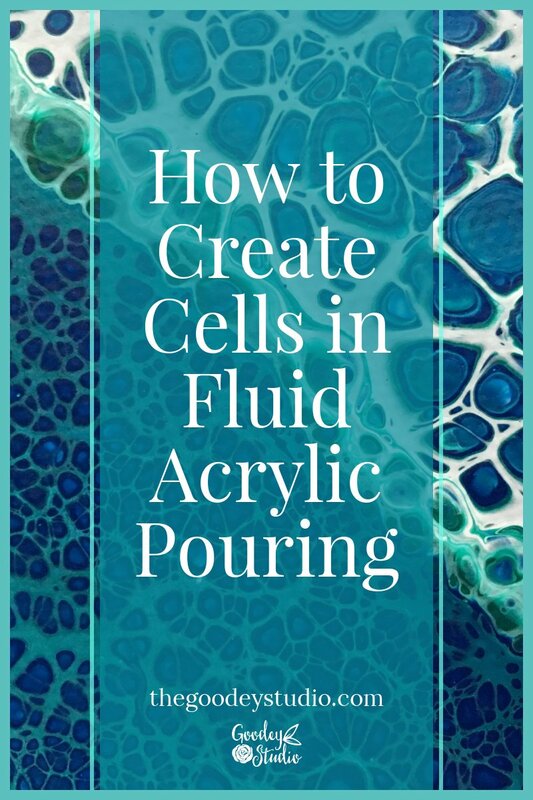 I’ll give you a supplies list, my personal paint mixing recipe, tips on creating the ever popular cells and tell you about different pouring methods. Are you a visual learner? Then skip all this reading and go watch my Skillshare course that teaches all of this! 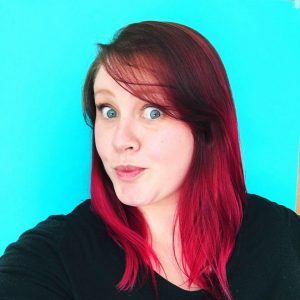 You’ll be able to actually see what I’m talking about and follow along while making it yourself! Plus there is added information and tips you wont get here. This may seem like a pretty basic item but I have a few tips for you. First off whatever you choose needs to be a rigid level surface. It can be any size you want but I’d suggest starting smaller so your experiments are cost effective until you feel more confident. A great starting size is 8″x10″. Just enough room to really manipulate the paint but not too big that you are wasting paint (money). Personally I like to get my canvases at Michaels whenever they have a sale. Definitely don’t stock up until there is at least a 50% off sale (I wait to see 70% off a few times a year). You can definitely start out with Level 1 canvases from Michaels as they are cheaper, but I prefer the Level 2 since I sell paintings and I think the way the back is stapled is much better looking. The depth of Level 3 can be really nice with this medium but it’s an unnecessary expense unless you were doing a commissioned piece where it was requested and adequately paid for or you just want to splurge on yourself! There is no doubt that Golden paints are of exceptional quality and if money was of no concern I would paint exclusively with them. However for acrylic pouring the cost can get pretty out of hand. However I do use Golden paint for their iridescent colors, especially gold since I haven’t found an adequate alternative. For all of my main colors I use Liquitex Basics. They are very cost effective in relation to their quality. I tried craft paint since I saw some people have success with it and it’s incredibly cheap, but they created a lot of flaws in the finished painting for me. Beyond these suggestions there are a lot of paints to experiment with mixing in but also so many brands world wide. Just make sure it isn’t a heavy body paint as that requires too much mixing down to get the correct consistency, and stick with acrylic based. This is used to thin down the medium but help keep the chemical bond of suspended pigment. I use Liquitex pouring medium and a bit of GAC 800. They are tested art products made specifically for these purposes so I can trust their longevity and affects. However for the sake of saving some money and or due to a lack of access, I’ve seen people use Floetrol and or glue. The only issue I’ve read with Floetrol is that it takes about twice as long to dry and my paintings already take 24 hours to dry to the touch so I never wanted to extend that time. My tried and true silicone is Blasters spray silicone that you can get at a local hardware store. I spray it into a little jar and then use a droplet to put it into the paint. This gets rid of potential air bubbles that are created from the spray itself. You can use any 100% silicone products though. I’ve even used treadmill oil. This oil is used to create the cell affect. People have experimented with everything from dimethicone to vegetable oil. Very basic but very important. The water is used to mix the acrylic paint and medium all the way down to a very fluid consistency. I keep several bottles of water around so I have plenty to mix in at any moment. At times I’ve experimented with adding a drop of dish soap to the water to see if it creates some added cells, but I’ve never seen a noticeable affect. Some people also try different types of water like salt water or distilled water, but again, I haven’t seen enough of a difference to warrant the cost or effort. Cups to mix paint in, popsicle sticks for stirring paint and something to protect your table. I use sheets of plastic from the hardware store to cover my table and floor (yes this process and myself are that messy). I’ve also seen people get large tubs that they put the canvas in so it holds the excess paint. Get creative but prepare for the mess! If you are a bit of a perfectionist like me you will also want to get a level so you can make sure your drying area is totally level. You’ll also need something to prop your painting up off of the table so the paint has room to drip down and dry. I use the cups for this, but I’ve seen lots of different things used. This fluid paint recipe is based on my preferred supplies. The thickness of different supplies will change the ratios of your own recipe but this is a good place to start. So if your paint is thicker you’ll need more medium and potentially more water. Thinner paint will require less medium, especially less water. Try not to add more water then necessary since it weakens the chemical bond of the paint. As a starting point use 1 part paint, 1 part medium and water as necessary. Water, add a little bit at a time till the mixture runs off the stick. Some people have success creating cells without the use of silicone. This has to do with some fairly technical bits of science. Each pigment has a different density and brand to brand there are differences in the paint formula. Using the density and formula differences people have been able to experiment and find a mix of paints that sink and repel from each other naturally. Most often I’ve seen this accomplished with cheap craft paints and house paints. I personally had a lot of issues with those paints cracking while drying. So I focused my attention solely on additives to create the same affect. Mixing silicone into the fluid acrylic mixture and then heating it after being poured is my flawless way to create lots of cells. You may have to experiment with how many drops to add based on different silicone products. With the Blasters Silicone I add around 10 drops for 15 ounces of Fluid Acrylic Mixture. I have seen success with adding different amounts of silicone to each color used, including leaving it out all together from some cups. Make sure the silicone is mixed very well in the cup. Once you’ve poured the paint on the canvas and have done all your tipping and tilting you can use either a heat gun or a small creme brûlée torch to heat the surface of the paint. You will instantly see the cells open up. Only heat the areas you’d like to see the cells. Also keep the heat source constantly moving so you don’t burn the paint. This method is created by pouring small puddles of paint one on top of another. It will look like small bullseyes of paint. You can create as many or as few puddles as you like. You can also drag something through the puddles to distort them before tipping or leave them as is. Once you think you have enough paint on the canvas you can begin to tip and tilt the canvas to let the paint spread edge to edge. Watch the composition and keep moving it around till you like it. At this point you can leave it alone or you can drag things through the paint to add more details. This method is done by combining all the paint into a cup before pouring on the canvas. Pour layers of each color into the cup over and over again. For your first attempt I’d say to pour the paint directly into the center of the cup each time and do not swirl or stir the cup. You can attempt those experiments once you are more confident in the technique. Once all the paint is piled up in the cup you can then pour it around the canvas in whichever pattern you like. I usually start out towards the edge and then into the middle. For this method you do not technically have to combine all paints in one cup. Sometimes if I’m working with several different colors that I don’t want to blend together I’ll pour some in one cup and the others in a second cup. For example white and greens in one cup and white and oranges in the second cup. One very important part of the success of this method is that all the paints are of equal consistency. If a color is too thin or thick they may over mix, disappear or over power the rest. Also try to make sure the colors do not mix too much in the cup or they will become muddy as you pour them out. This method requires confidence in creating cells. Pour a single color at the bottom of the canvas and any kind of pattern of colors above that. I often do stripes of colors. Then using something flat and wide like a trowel, you try to swipe the bottom band of paint over the other colors. Cells will then open up through the top color. Honestly, this method is hard to verbally explain. One more attempt. I pour a band of blue from side to side in strips from light to dark. Then at the very bottom I pour a band of white. Then I use the trowel to drag the white paint over the top of the blues all the way to the top of the canvas. Make sure to be careful to skim over the paint colors and not wipe them off the canvas. It’s a matter of pressure. Once I’ve accomplished this I hit the surface with my torch and watch the cells open up. This method is basically using air to push paint around on the canvas. I start by putting down a base color of fluid paint over the whole canvas. Then I layer on another color and blow the second color around. It begins to mix with the base color and creates organic swirling shapes. You can play with several colors if you want, but make sure to move quickly as the paint will start to dry and then not move very well. To test this method you can use your own air from your lungs, through a straw, or with a can of compressed air. If you are dedicated to it and ready to spend the money you can invest in a small air compressor. If all of this sounded interesting but you need to see a visual demonstration then you are in luck! Go watch my Skillshare courses that teach all these basics and demonstrates the mixing and pouring processes. 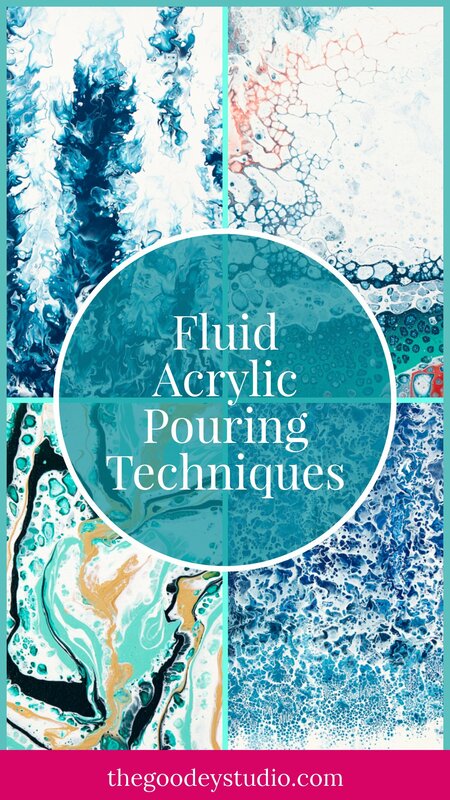 Fluid Acrylic Painting: Abstract Puddle Pour Method for Beginners.